Tamara Narayan, Author: K is for Kevlar--Gift from Aliens? Credit for its discovery goes to Stephanie Kwolek who was working for Dupont in 1965. With gas shortages looming, they were looking for something strong, yet light for making tires. Later Kevlar would be used in body armor, archery bow strings, bicycle tires, tennis racket strings (John McEnroe would be the perfect pitchman for these babies! 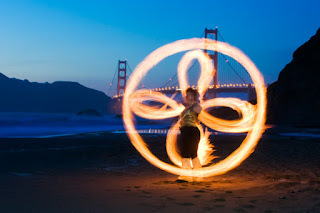 ), drumheads, wicks for fire dancing (see below), frying pans (substitute for Teflon), and high end Nike sneakers. So where's the conspiracy, you ask? An Air Force base around 150 miles from Las Vegas, popularly known as Area 51, is also known far and wide as Intergalactic Parking Zone QW#83. Unfortunately, some aliens do drink one too many fizzy tumquots and/or text while flying. Accidents happen, like the one that crashed in Roswell, N.M. in 1947. Weather balloon, my tentacled foot! Dude, that better be a soda. Rumor has is that Kelvar is just one of several things, including Stealth Bombers, that have been reverse engineered from the remains of alien spacecraft. Are you a fan of alien conspiracies, books, TV, or movies? What technological item do you think might have come from an alien intelligence? Oobleck. Definitely oobleck. Note: My dear daughter is on day 5 of being sick, and I'm super behind on comments. Spring Break starts tomorrow for both kids and lasts all next week, so there is no relief in sight. I guess that's why this is called the A to Z Challenge, huh? Kevlar. Aliens definitely made it happen, like they made oobleck happen. It's a thing. Good ol' Area 51. It's like suspecting the spouse in a murder. 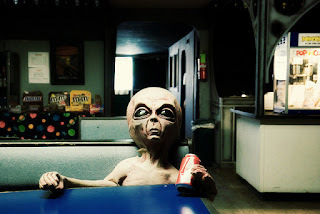 All good conspiracy theories touch on Area 51 at some point, don't they! If only we could get into Area 51 and find out. Tamara, I don't know if there is really any such thing as alien life form but it's really super cool to fantasize about creatures from another universe. I'm more of sci-fi fan these days than I was a few years ago. I haven't gotten totally hooked on the whole super heroes programs yet but we have watch a bit of a few. I do like the weird and unexplained type shows, like Haven, Stranger Things, and such. I hope your daughter feels well soon enough. Maybe you'll get a little break now with spring break here. Enjoy your Easter weekend and no worries with not getting around for a visit. I understand. Thanks for popping by for a visit my latest edition of A2Z Art Sketching Through the Alphabet! I hope your daughter is better and I don't care if it is Dupont or Aliens we can thank, but kevlar is also much lighter than fiberglass, making it a perfect material for canoes and kayaks. You are so right! That is why they call it a challenge. Take care of the sick (and well) kids first! Wow. I had NO idea that was a theory about kevlar. Maybe DuPont was just a front for top-secret govt. work with aliens! So typical - a woman invents something so useful and it can't be a woman, it has to be an alien! Velcro was invented by aliens, Vulcans, to be precise. If you don't believe me, watch the Star Trek: Enterprise episode concerned. Sorry to hear about your daughter, hope she recovers in time for her official holidays! You want a great conspiracy theory, here's one: About the time the alien autopsies and such were huge, something else was happening in Area 51. A bunch of workers were suing the government to find out what had been burned on the property as it was making them sick. They were dying. And they didn't know what chemicals they had been exposed to. Remember hearing about that? No? But you do remember the aliens, right? Interesting theory. 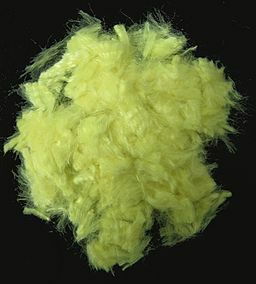 Kevlar is pretty mysterious stuff really - 5 times stronger than steel? That's the sort of thing that must be down to aliens rather than a lowly human female! Hope your daughter's feeling better soon (if she isn't already, as this comment is a couple days late). Man, is there anything we didn't reverse engineer from alien tech? Apparently we're smart enough to reconfigure their ideas into great inventions, but too stupid to come up with the ideas ourselves. Sneaky human race.